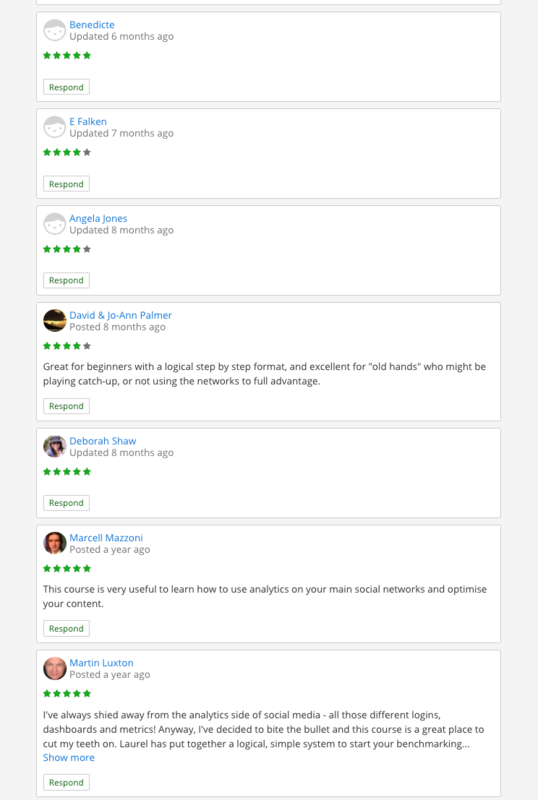 While this course, video screencasts and downloadable sheets are for my 3 Day Social Media Professionals Intensive, the concepts behind a Social Media Audit are worth reviewing at a high level for everyone. Are you growing subscribers "owned audience"? What is your funnel for building that audience? Are you gaining interactions "engaged audience"? Are they helping you with your Reach "earned audience"? Are they the right target market/audience? "Preferred audience" etc. Are you posting often enough? The Last Actor 50 Algorithm dataset? Are you changing your cover photo regularly "magazine cover"
Are you using the right keywords and hashtags? Facebook Lexicon, and Google KV. How does your Voice connect to your Target Audience? This is a Corporate course for Business, Government and Not for Profits also For my Uni Students (business), 3 Day Intensive students and really any social media consultant (advanced) who wants to do a quick benchmark of multiple social media platforms analytics and measurements in preparation for pitching to a potential client, speaking to a new client or reviewing standard practices in Social Media before developing a full analytics and measurement report. While this course is not a social media measurement and analytics course it does introduce tools such as Facebook Insights, analytics for Instagram and LinkedIn groups and Facebook groups as well as Twitter's new Analytics tool. My clients often ask me to undertake an audit of their social media accounts so we can benchmark their channels, set some KPIs and develop a social media strategy. This course will allow YOU to do that Social Media Audit, with step by step video tutorials, a downloadable Social Media Audit template and indepth information on what tools to use for not only Facebook Page Insights but also Facebook Group analytics, LinkedIn Group analytics, Twitter, Instagram and so on. LIVE Classes: 2016 FYI Uni, Organisations & 3 Day Intensive students: this is the audit to bring to class. Join the 11,000 students that study with me online, the 10,000 social media professionals I have trained offline in the last decade and work on your social media and online community management skills! Forbes Magazine named me in the Top 50 Social Media Influencers globally,named head of media, social media by Marketing Magazine and in the Power150 AdAge Media bloggers. I strive to show the theory/strategy with practical tactical tools in online community building. I am a CERT IV Training and Assessment certified trainer (Diplomas and Certificates etc) and I also have taught a Masters of Convergent Media. Professionally, I have managed Facebook Pages for Junior Masterchef, Idol, Big Brother etc. and have consulted on private online communities for banks, not for profits & governments in SE Asia. I have taught social media for businesses at University of Sydney for 10 years and I have 11,000 online students. My clients range from UNHCR and TV shows to small businesses and Women Matter (Saudi Arabia Women of Islam community). I have a quarter of a million followers online, personally reaching around 6 million people per month through social media. I have taught around 100,000 people in the last 10 years how to build online communities, create social media content, write strategy documents, drive social media campaigns and improve their Facebook Page through FBO and earned attention. How Do I Contact Laurel? You can email Laurel's PA (Fiona) on [email protected] Mail goes to PO Box 32 Mount Victoria, NSW, 2786 Australia. Most courses start now and never end! It is a completely self-paced online course - you decide when you start and when you finish. Others are Instructor Led and have a start and finished date. Check! The real life classroom usually start at 9:30am and finish at 5pm. Uni starts 9am. Most courses are lifetime access. Real life courses may have an online component - please check - that has lifetime access. Challenges may be for the life of the challenge - 30 days for example. Check! What if I am unhappy with course? We would never want you to be unhappy! If you are unsatisfied with your purchase, contact us in the first 7 days and talk to us about a full or partial refund. Thank you for the wonderful testimonials!